At the US Sailboat Show in Annapolis about 10 years ago — pretty sure Diane was anticipating an icy cold margarita right at this moment. It’s the Ides of March, the day when Julius Caesar was killed in 44 BC. This year it is also the fifth anniversary of the day my husband’s sister died, and so it tends to permeate the thoughts of all our family in myriad ways. 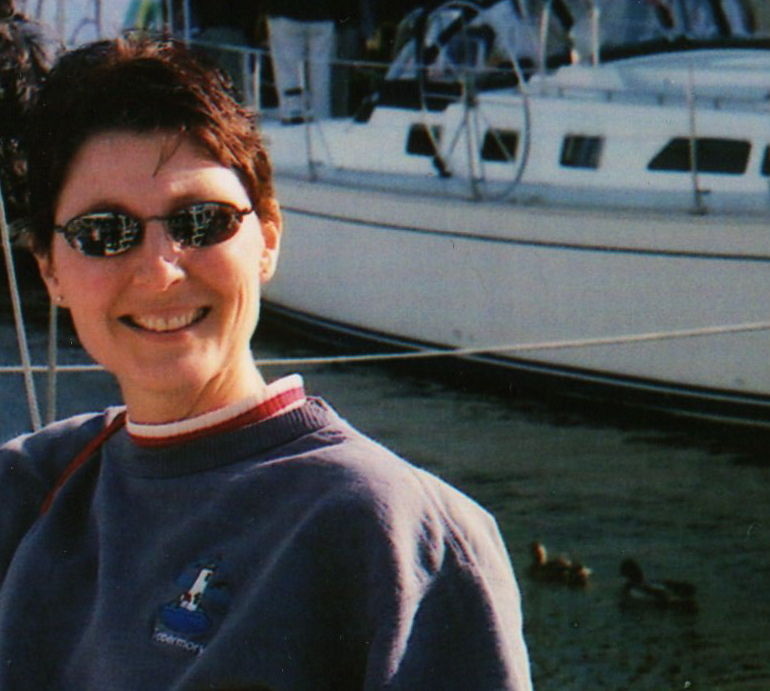 Diane was just five weeks shy of her 49th birthday when she died after a 10-month battle with breast cancer. The last time I saw her, during the summer before her death, she had a colorful silk scarf wrapped around her head and we drank margaritas. The anniversary of a death is like the elephant in the room — you know it’s there, you think you should acknowledge it, but you also think that maybe if you ignore it, it will just go away. Unfortunately, an elephant can’t fit that easily through the door, so what you end up doing is walking around it uncomfortably, trying not to get too close to it and wrinkling your nose at its strong odor. We tend to want to acknowledge Diane’s birthday, perhaps with a drink or flowers, but not her deathday. It somehow feels wrong to acknowledge it — but it is possibly the single most important day in our collective family, something that each of us has shared in and of which we all hold some memory, however painful. For me, there is the knowledge that I did not know Diane that well. She lived in suburban Detroit with her wonderful husband and two beautiful daughters — all of whom I adore — but I did not feel that much of a connection to her. She was quiet, and nice, and maybe she represented for me the things that I feared — a suburban mom with a no-fuss haircut and sensible shoes. She also had that thing that I feared most, a 9-to-5 job with a retirement plan — although I have come to realize that maybe the thing I feared more was that if I ever had a job doing something that I loved, then I might end up not loving it any more. I honestly don’t know if she loved her job or not, or even if it mattered to her if she loved it, but her coworkers came out in droves to her funeral with beautiful and kind words about her impact on their daily lives. Prior to her diagnosis, Diane and I were basically just connected to each other through her brother, my husband, occasionally chatting about our daughters and sometimes she would ask me for recipes, because she liked my cooking and was, she admitted, not a very creative cook herself. After her diagnosis, we talked to each other more often, because she wanted to learn more about organic foods and vegetarian dishes, crossing her fingers that a change of diet could slow the growth of cancer cells. I did the only thing I really knew how to do, which was to type up a three-page list of ingredients and resources, explaining how to substitute soy and vegetables in her favorite recipes, and I packed it all up in a care package of beans and rice and whole-grain pastas and organic brownie mix. It didn’t work. In the end, all that was left to do was for her friends — and she had a large group of loyal girlfriends, something I will always envy — to make her margaritas and play Tom Petty really loud on the CD player. Diane loved margaritas and was known to travel to Daytona Beach on vacation with her blender; in fact some of my fondest memories with her feature hanging out on the beach by Perry’s Ocean Edge Resort, drinking frosty margaritas and watching her husband bake in the sun. Diane told me once that she was glad that she’d had two girls, because she always wished she’d had a sister (not that having my husband as her annoying little brother wasn’t a treat, of course) and she was glad they could have that special relationship with each other. The most unsettling thing about death is that it leaves the living filled with regrets — could I have been more than just a sister-in-law, if I had had more time and been less absorbed in my own little world? I’ll never know the answer. What I do know is that perhaps the best thing I can do today is to acknowledge Diane’s life — and death — with a cold margarita — no salt, please. 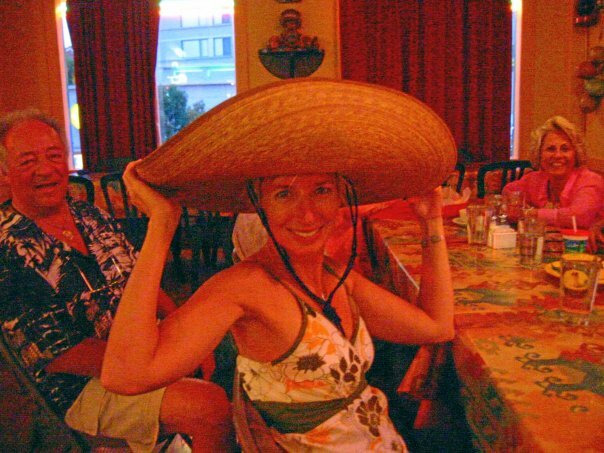 You gotta watch out with the margaritas when you’re hangin’ with the Weber clan, or you end up with the big sombrero. I’m thinking that there’s nothing like a little tequila and imaginary sunshine to chase away the blues on the Ides of March or a deathday. This tasty version of a margarita is a favorite in our family — I generally make ’em by the pitcher, but I will give you the single serving recipe and you can multiply it for the masses. Cheers! Shake the ingredients in a shaker with ice; pour into a glass (I like it with the ice cubes), mix in a splash of Sprite, and top with a 1/2-ounce of Amaretto. Garnish with a slice of fresh orange. Yum. Kristen, this is just beautiful. I’ve gotten some requests asking how to make a pitcher of Italian margaritas. I’m going to base this on a standard 32-ounce pitcher, so you’ll have adjust if your pitcher is a different size. If you’re making a pitcher, rather than just a couple of individual glasses, then buy some limeade. I have a citrus press and have juiced a couple of cases of limes before when making a lot of margaritas for a party, but I have learned than a can of frozen limeade works just as well, especially when you add some fresh-squeezed lime juice. However, do not use those little plastic green lime-shaped bottles of lime concentrate. That stuff is awful — frozen limeade is actually better, and it’s already sweetened so you don’t have to add sugar. Mix all ingredients in a pitcher (including fruit wedges) without ice and chill for one hour; add about a 1/2 cup of Sprite (lime seltzer is great too), pour over individual glasses with ice and add a splash of amaretto to each glass after pouring. Kristen, this blog moved me tremendously. I lost my only sister, Susan, to breast cancer. She was a housewares buyer for a department store and through her I had the best-equipped kitchen. Our Mom didn’t teach us to cook, so we used to share disaster stories. Like the time she was making turkey tetrazzini and seeing the recipe called for ‘heavy cream,’ used Cool Whip instead. For a time after she died, I stopped cooking. My heart wasn’t in it. If my husband hadn’t taken over for a while, we’d have starved. When I went through my sister’s papers, I put aside recipes written in her hand for her daughter to have. Today, making any of her favorite foods brings a smile to my heart. A toast to Diane and Susan! Christine, thank you so much for sharing your story about your sister (especially the turkey tetrazzini!). Last night, everyone in our family — in our various locations around DC and Michigan — had a margarita in Diane’s honor. I know she would have liked that. This was such a beautiful article!! I was moved to tears and I know that Diane would have been moved to tears as well. You have honored her with your words and thoughts in such a wonderful way! Not that I have to tell you, but never doubt how wonderful you are and how appreciative Diane would be as to the fantastic Aunt / friend /support/ and I am sure so much more, that you are to her two beautiful girls. I am printing this and sending it to those in our family who do not have access to a computer (the older generation) and the those who may have missed this! We believe that cocktails really do create community. Here’s why we’ll be drinking margaritas tonight. Raise your own glass in memory of a loved one!